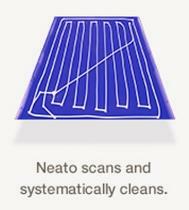 Neato Robotics Neato XV Signature Pro Robot Vacuum - instant multi-room cleaning. Brand new Sealed Unit, Official UK Stock, 1 Year Warranty. Strongest suction available in a robot vacuum . It's a robot, and a vacuum. The Neato XV Signature Pro is the smartest robot vacuum. Its improved aerodynamic design hugs the floor for superior pick-up on all floor types. Neato's unique square front and low profile design keeps it close to corners and walls for maximum pick-up of dirt, dust, debris, and pet hair all without sacrificing suction power. It automatically moves from one floor type to another, and even manages rugs with fringe. 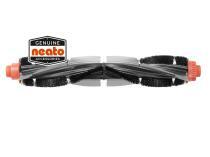 The Neato XV Signature Pro comes with two high performance filters which makes it a great choice for anyone with allergies or who is concerned about dust. The versatile brush system offers the best performance on all floor types. The blade brush is great for carpeted floors, and the combo (blade and bristle) brush is especially quiet on hard floors and effectively picks up debris and pet hair from all floor types. Makes your life easier and your home cleaner come home to that "just cleaned" look. Control Centre: Easily schedule daily cleanings, or just push a button for spot clean or instant multi-room cleaning. Software Upgrades: Robot software can be upgraded when new features become available. Advanced laser guided navigation means the XV Signature goes automatically from room to room, cleaning close to edges, in corners, and carefully around furniture. Its Smart Sensor technology automatically detects and avoids stairs, and doesn't bump into furniture like other robots do. It returns to the charge base and resumes where it left off. The technology is a revolutionary system developed by Neato Robotics that combines laser vision with mapping. The robot uses a laser and sensors to see its surroundings and create accurate maps of areas to be cleaned including furniture, objects and doorways. The robot constantly updates its map of the room, so if a new object is added into the room during a cleaning run, the robot will add it to the map. The improved aerodynamic design picks up 50% more dust. The two high-performance filters are the best choice for reducing dust and allergens while the the blade and combo brush duo offers the best performance on any floor type and picks up tough pet hair. A lot of home robot "vacuums" are really just sweepers. Their low vacuum power is merely an add-on. But not the Neato. At the core of every Neato is a centrifugal compression-impeller that uses jet engine airflow principles to create high-powered suction. You can count on our household robots to pick up everything a traditional vacuum would in the homedirt, pet hair, dust, cereal, and more. It takes care of itself. A Neato robot can handle large floor plans, because it automatically recharges its batteries. When it's low on power, the home robot simply returns to its base and recharges. Then it returns to clean, right where it left off. With a Neato there are no bags to buy or throw away. All the dirt and debris are collected in the Neato's top-loading dirt bin. When the bin is full, you simply empty it into your trash. Our robot vacuums for pet hair feature two very special tools for removing allergens from your home. The bristle brush traps pet hair and lifts it from the surface. Then the special pleated filter removes particles from the air stream down to 0.3 microns in size, including mould, spores, cat and dog dander, dust mites, pollen, textile and carpet fibres.